Containers are a gardener’s best friend—they make it easy and fun to bring a burst of life and colour to your porch, balcony or front step. But so many of us get stuck in a rut. 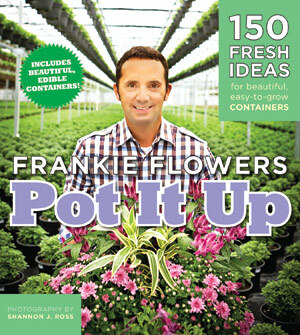 Frankie Flowers is here with 150 inspiring, beautiful and sometimes surprising container ideas to get your juices flowing. Each plays with Frankie’s signature technique of using a thriller, a filler and a spiller to make sure your pot will have maximum impact. Frankie gives you the breakdown on which plants he’s used, and to which conditions they’re best suited. And if you’re feeling a little peckish, Frankie’s even got some delicious edibles for you to throw into the mix. With Frankie’s step-by-step instructions, and the don’t-sweat-it attitude readers came to love in his first bestseller, Get Growing, Frankie’s Pot It Up will have the whole country going to pot—in the best way possible!